Since the Generation 3 figures are mostly about updating and improving G1 designs, a lot of G2 stuff is getting overlooked and forgotten. 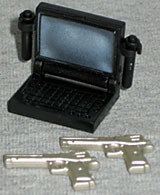 Although he is more likely to be wielding a soldering gun than one that shoots bullets, Hi-Tech can be depended on to pitch in during a real fight, by taking control of any number of complex technological weapons systems used by the GI Joe team as they battle the nefarious forces of Cobra. A good-natured soul who can't bring himself to say "no," Hi-Tech spends most of his off-duty time repairing the personal vehicles of GI Joe teammates, fixing their TVs and stereo systems, and troubleshooting their PCs and laptops. He doesn't mind it a bit. He says it's all good practice for when a key piece of a weapons system fails during a real fight. His latest work involves developing technology that can remove the animal hybridization venom that has been developed by Dr. Mindbender to create more powerful and dangerous Cobra troops. Admit it: you've never heard of Hi-Tech. He was released in this two-pack, again in a Built-To-Rule set (and even made the jump to the Sigma 6), but then was never heard from again. Kind of a shame, really. It's not like he's a bad character or anything - it's just that he's not very good, either. A guy who likes to fix technology? It's not the lamest trait any Joe has ever started with, but he could really use some attention from Larry Hama to really make him interesting. 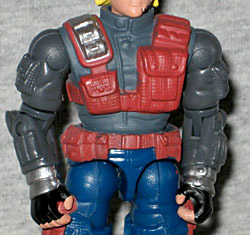 The figure's proportions are strange, even by G2 standards - his arms are stumpy, and his torso is very wide. Part of that may be all the pouches and pockets on his outfit: they make sense for a guy who's half mechanic, half tech support - you can assume he's carrying replacement parts in there - but on anyone else they'd be stupid. His colors are pretty cool: brick red web gear over a grey shirt and blue pants; it's not a combo we've really seen before, but it's nice. I wouldn't be surprised to learn it came straight out of one of those color combo guidebooks. His head's a bit weird, though. 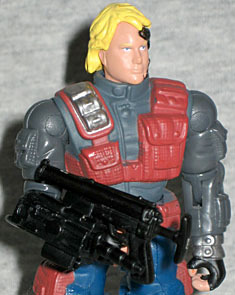 He has shaggy blonde hair, which seems a bit "non-military," even for a unit like the Joes. He has a black technological headset that just appears to be glued to his face somehow (not on the toy, on the real guy; on the toy it's sculpted). The card art shows him with a headband, which would at least explain how it stays in place. Hi-Tech's accessories include a plain black knife, an HK69A1 grenade launcher, and one of those black communicator wristband things that a lot of Valor vs. Venom toys came with. And holy crap, this figure came with instructions, so this is the first time I've ever realized that stupid accessory was meant to be used as a wrist-mounted holster. "Gauntlet has attachment places for weapons (if included)," to quote the text. Seriously? Why did none of the other toys tell us this? So why does Hi-Tech have instructions when none of the other toys did? Because he also has a big freestanding missile launcher, and they want to make sure you know how to put it together. 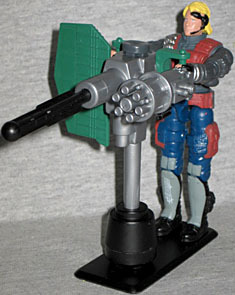 In addition to firing a black, finned missile, it includes a base with a footpeg for the figure, a Gatling gun sticking out one side and a big green shield coming out the other. It's not exactly what you think of when you think "combat engineer," but it makes a kind of sense. As long as no one shoots at his legs. The originator of Cobra mind-control programs, Dr. Mindbender turned his evil genius towards the creation of genetically altered super-warriors, perfecting a venom that adheres the DNA of the earth's most ferocious and dangerous animals to human DNA. The resulting hybrids are faster, stronger, and more resistant to pain than the normal human Cobra troopers. They also require less maintenance and don't seem to mind that they aren't being paid. Dr. Mindbender was once a kindly orthodontist who, in his quest to relieve dental pain through mind-control, tested his brainwave scanner on himself and was turned into a malevolent maniac with definite anti-social tendencies. In Cobra Commander, he found a perfect patron who shares his evil views and has unlimited funds to finance his wildest and most unnatural experiments. Hey, wait a minute, that's cheating! It was Dr. Venom who invented the Brainwave Scanner, not Dr. Mindbender. Whatever. There have been six Mindbenders since he was introduced in 1986, and this is the only one that looks even remotely like a doctor. He's wearing a pale gray lab coat with a high collar, grey pants, a maroon shirt, and black boots and gloves. It's kind of like a human version of Zoidberg. This definitely beats the bare chest and suspenders look. Would you trust a doctor who dressed like a circus strongman? The head, however, is classic Mindbender: a bald man with a mustache and eyewear. Of course, he used to have a big, bushy handlebar mustache and now is rocking a Fu Manchu, and instead of a monocle he's got a tiny pair of square pince-nez glasses. This is the way he appeared in the Devil's Due comics at the time, so it's a look that suits him. Dr. Mindbender's accessories are more prosaic than Hi-Tech's: he has a pair of silver Desert Eagles, two test tubes - all of which were reused for Dr. Venom - and a laptop computer. The computer is hinged and has clips on the sides to hold the test tubes. The screen is metallic blue, and the keyboard is sculpted; this is a very nice piece! 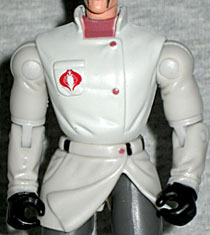 It's almost worth buying this set just to get Dr. Mindbender, which is good, because that's why I bought it. I wanted a modern Mindbender, and this set delivered - of course, there's now a more modern version, but that's beside the point. The Hi-Tech that comes with him isn't a must-have new character, but he's interesting enough, and his inclusion doesn't ruin the set. Like a lot of toys from the past decade this one can be picked up on the cheap, and it's well worth those below-retail prices, if you don't mind figures that are a little shorter than today's offerings.